The land now occupied by Trinity Episcopal Church was donated in 1882 through A. A. Low, a New York associate of Collis P. Huntington, who was then president of the Chesapeake & Ohio Railroad. Mr. Low's family also raised a substantial part of the money needed to build the church, with Trinity’s congregation assuming responsibility for the balance. Building Committee for the church back in 1883. Fast forward to the early 1960's, when Trinity undertook a major expansion of the church nave and the parish house. ​east wall to allow for small outdoor services. A Columbarium was added in 1989, and expanded in 2003. 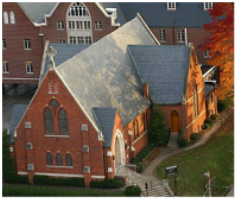 With its old red-brick exterior and stone trim, Trinity is often described as looking much like an English chapel. The buttresses that support the high-pitched slate roof lend a Gothic air to the interior. A light-filled cloister connects the church with the 30-room parish house. ​depicting the seven sacraments. With a single exception, all of the windows in the church itself were made by either Willet or Tiffany. ​The Tiffany windows are considered to be collectors’ items, and as a group, Trinity’s windows are said to be among the finest examples of contemporary stained glass windows in this area. The simple, charming Bethlehem Chapel—used for small weddings, funerals, and other occasions—is located on the ground floor of the parish house. The Chapel was beautifully renovated in 1987, and again in 2003 following a small fire.